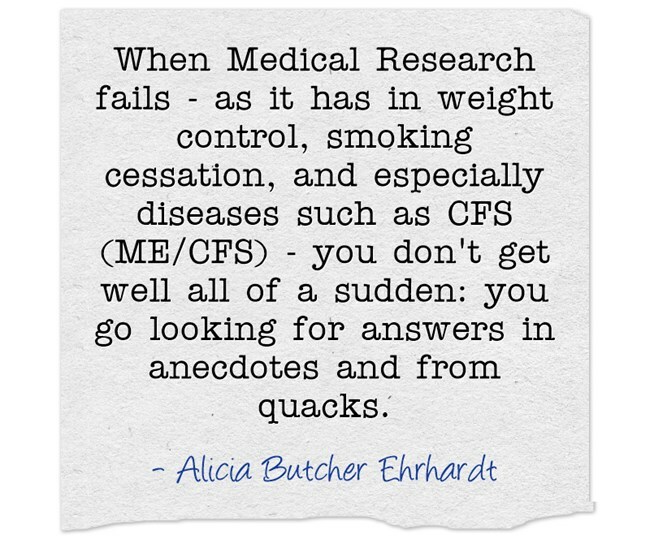 Whatever they call it, CFS, ME, ME/CFS, CFIDS, SEID… they still have no answers I can believe. I can’t go to a doctor in my state (NJ), get tests which determine what I have and how severe it is, get a prescription for medicine which helps my symptoms (brain fog, pain, post-exertional collapse, swollen lymph glands, and perpetual exhaustion, among other things), and have a doctor titrate the right doses so I get better. Vitamin B1 in megadoses (plus Celebrex, a cox-2 inhibitor used mostly by arthritis patients – which helps with pain) is the ONLY thing that has helped of the many things I’ve tried in 25, almost 26 years of having the disease half of all doctors (including my primary) still believe either doesn’t exist or is all in my head. I’ve gotten used to that state of being – I can’t change it myself – and I refuse to let it take the rest of my life away from me. For all the posts I’ve written about this over the last couple of years, type ‘B1’ into my search box. There you will find out where I got this idea, why it seems relatively safe, and how I’ve experimented with it. How much is a megadose – and what do I actually take now? I’ve been meaning to update the B1 information for a while, because the B1 posts (type B1 into the search box) are some of my most popular, but I was hoping to have a better report. I tried a couple of things which I will discuss after reviewing my ‘protocol,’ but they didn’t work for me, so I have little new to report – except that I tried them and what they were. I AM TRYING TO FINISH A BOOK – PRIDE’s CHILDREN, Book 1 is almost ready to publish – and moving slowly and relentlessly in that direction, but that’s why there haven’t been many blog posts. And, curiously, I don’t seem to have much to blog about, except when, in the process of getting Pride’s Children, Book 1, ready to go up on Amazon, I run into a wall, and have to figure out how to get through it. AND haven’t seen anyone else solve that particular problem for me in a way I can use. I seem not to think in blog-size chunks when buried in the minutiae of chasing plot holes and typos. But I’ve wanted to do this update since I did the failed experiments. I set out five ‘doses’ of B1 every morning. A dose consists of 500 mg. of Solgar Super Potency Vitamin B1 plus a 160 mg. capsule of Piping Rock Benfotiamine (fat-soluble B1). Why the change in benfotiamine? Because my original pills, which came from Source Naturals, had a bad batch, and the pills (150 mg.) would crumble when I set out my five doses for the day, something which hadn’t happened before. We went around with the company who sold them to me, and they replaced them with another set of bottles – from the same batch, and with the same problem – so that was that. I can’t be without it (I think – I haven’t tried), and I can’t in clear conscience take pills that crumble into dust. EVEN though the capsules may have the exact same dust – they were MEANT to be capsules. I have that as a reason – your mileage may vary. For the year and a half before that, the Source Naturals were fine – and they probably will be again. I may try them again, but right now I need at least the illusion of consistency – I’m trying to finish a book! On the basis of learning that the B1 is supposed to be a co-enzyme for the metabolism of carbohydrate (of which I eat as little as possible), I take one ‘dose’ with each meal or snack. I often find, at the end of the day, that I’ve omitted one or two doses – the brain forgot. I don’t notice enough of a difference to know it there is one – but then the thing that does the noticing is the same brain that doesn’t work. Some of those naps I spend doing breathing and gentle exercises, stretches, and isometrics. Other times I crash into a deep sleep. It depends on many things, including whether I got a good night’s sleep, and whether I’ve been fighting to put the nap off as long as possible. The brain fog doesn’t help. My naps are 35 min. with a timer. Except that sometimes I go a lot longer. I let myself sleep if I need it – nighttime sleep is erratic, but doesn’t seem to depend on how many naps I take, or how long they are. So I just listen to my body if I can. Long story, but I was getting useful effects from taking half a Bronkaid tablet (ephedrine as a bronco-dilator, OTC). I would take only a nap or two, and even thought my peak brain efficiency didn’t seem appreciably higher, I seemed to be in my best state for longer every day. 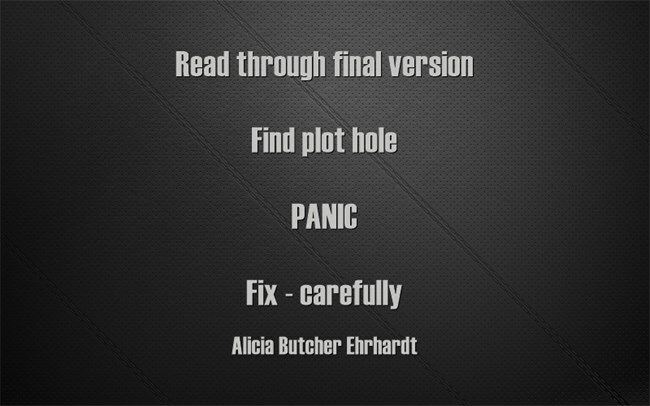 That was good – and I loved it, and I used the extra good time to make writing progress a bit faster. The bad part was that 1) my blood pressure started rising, and 2) the muscle pains got horrific – razor blades embedded in my flesh. After some internet searching, I found that the first effect was not uncommon in older people like me. And the other one ditto – except that some people suggested drinking more water, and I tried that – but ultimately it didn’t work. Horrific pain was the killer – I stopped taking the Bronkaid that way (off label – do not use unless you are prepared to accept the consequences, or don’t get them). I could NOT get rid of the pain, and spent a lot of time doing stretches, yoga, etc., and was taking way to many extra pain pills. But it DID work, and I miss its effect. It was nice to be a bit more coherent, take fewer naps, and get more done. Portkelly, who commented on one of my early B1 posts, mentioned that he takes 10 mg. of manganese with the B1 – I think every time. THIS IS WAY TOO MUCH FOR ME. APPARENTLY, if your system doesn’t process the manganese (source: the internet), and if you are older this cn happen, it ACCUMULATES – and again raises your blood pressure. This getting old is not for sissies – when I tried adding the manganese, just 10 mg. a day (not a dose), MY blood pressure started rising. As soon as I noticed it, I cut out the Mn – BP dropped in a week or so to normal. So now I add ONE 10 mg. capsule to my pills ONCE a WEEK, so I have a small amount available (think I), but don’t have the BP effect. I am NOT recommending either of these experiments. I am reporting on them. I realize I am in the older demographic – and probably have compromised everything, and so get the side effects. But I cannot, in due conscience, recommend anything I’m not using, and that actually caused me problems. Maybe somebody younger will be luckier. The B1 has not had any side effects, and I still think it give me that remaining one daily period in midday where I can actually think and write. When I’m finished with this book, I may try again to see if the effect goes away if I stop taking the B1 ‘doses’ up to 5 times a day, but right now it’s in the category of superstitious behavior needed to get me through to publication, and I’ve done al the experimenting I’m going to do for the foreseeable future – I can’t afford the side effects of my failed experiments. So, yes, I’m taking it. In general, comparing to before, I think it helps 15-20% part of the time. But I also realize I’m a more mature writer, and have made the effort to be professional about it, getting to that chair every day to write. I may be fooling myself, but it’s not as if anyone has come up with anything else that I can be sure works. Be careful with all this stuff – pray for SOMEONE to figure this disease out. If we had medicines that worked for pain, brain fog, post-exertional collapse, swollen lymph glands, exhaustion – and all the rest of our symptoms – we wouldn’t be looking for anecdotes. Feel free to comment – but I have no additional information, no expertise, and no medical training. This entry was posted in CFS - living and writing with ME/CFS/CFIDS, This writer's life and tagged brain fog, CFIDS, CFS, false hope, Hard choices, hope, ME/CFS, writer behavior mod on September 12, 2015 by Alicia Butcher Ehrhardt.